Transform Yours and Change Your World. 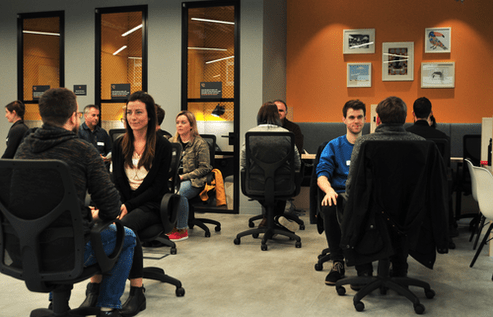 This 4 week programme will help you create deep and authentic connection quickly with anyone - leading to increased influence, greater fulfilment and greater opportunity. Can’t make the March Programme? We're running another in July! Prior to July's programme, we shall be running a series of ‘Appetiser’ evenings to let people experience learning with us. Here we will help you develop simple but powerful skills that can help you start conversations with anyone. In an evening you will learn to inspire interest, break out of frustrating and limiting scripts, and gain the freedom to be yourself. 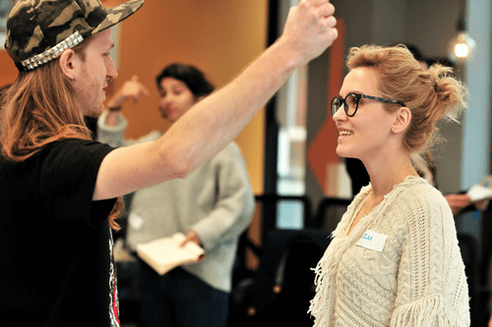 “I had high hopes for the programme, realising the many ways that changing my conversations could enhance my life – personally and professionally. I’m emerging at the other end with not only a greater confidence that those changes are possible but with a real, practical sense of how to get there. I’ve gained a set of tools to use in conversation to get to know people in my life more deeply, and had ample opportunity to test them out in a safe and supportive environment. I’ve also become more aware of the underlying beliefs and assumptions that were contributing to holding me back before. As those dissolve I’m feeling more free to be vulnerable and authentic and courageous in my interactions from day to day. 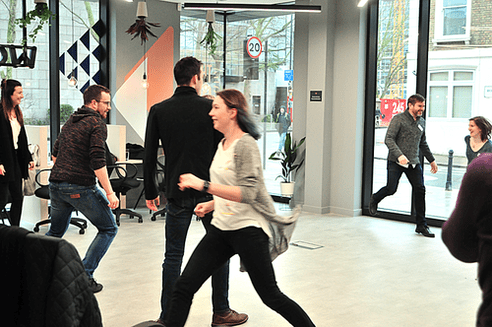 At Trigger Conversations, we see a world where everyone feels completely unbounded by expectations; where we are free and accepting of ourselves and others, so that we can start conversations that flow naturally, expand adventurously and build connection quickly. Conversations are at the core of our human experience. It is through conversation that we relate to others, understand each other better and take action. Every conversation holds within it enormous potential: the potential to connect, to learn, to build or to grow. Our ability to transform our lives, and those of others, relies upon our ability to communicate a shared vision. Yet, little often do we take stock of the enormous power lying dormant in our everyday interaction. Instead, we make do with conversations that bring little value to our lives and to others. We feel stuck in predictable scripts, in need of surprises, excitement and spontaneity. We struggle to find connection, either too stuck in the confines of our own thoughts, or unsure how we can truly connect with the person in front of us. We feel bored, isolated, uninterested and unseen. We know we have more to offer, and we can feel that there is value we are missing. We crave freedom, authenticity, to be ourselves and discover more. So What are Transformational Conversations? Transformational Conversations are an adventure. They are the feeling of freedom; as we let go of our agendas, let go of our masks and, arming ourselves with just the right tools to oil the machine, we create a space for connection and serendipity to happen. Transformational Conversations enable us to be ourselves and welcome others to do the same. They are two people interacting uninhibited, experiencing flow, inspiration, passion and acceptance. And a result of this freedom, we feel more connected, we discover opportunities more easily and we experience greater value in our interactions, and more of them. A chance to break out of tired scripts and small talk, and instead to experience a sense of adventure and the unknown. Invitations to be ourselves and to see what happens when we are free to think and live without restriction. Easily discovering new friends, connections and opportunities in the most unlikely situations. Gaining maximum, heartfelt value from every encounter. Why are Transformational Conversations Important? When we feel frustrated or stuck, unheard or socially isolated, living with unfulfilled potential or with a sense of undiscovered opportunities, Transformational Conversations offer a pathway to exponential clarity, opportunity, serendipity, expansion and growth. You are tired of jumping through hoops in order to “fit in” to empty social situations and the thought of yet another transactional conversation leaves you tired and frustrated. We get it. It’s inauthentic and everyone’s driven by agendas. But still we all have to do it, right? 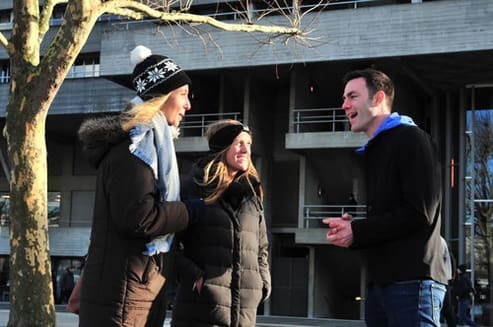 By transforming your conversations you effortlessly walk into a room of strangers and connect with anyone, finding common ground instantly and making unforgettable connections. You’re ready for a career change, but the world is big and full of potential. If only you knew where to start? Start with conversations. They are where you can go to road test ideas, connect dots and discover what’s next. You feel stuck in the same old scripts every day, constantly yearning for conversation that surprises and excites you. Don’t wait for it, engineer it! You’ve read the books, attended the courses and yet you haven’t found your edge quite yet. We’ll take you there. You feel stuck or limited in your intimate communication and you want to effortlessly discover deeper levels of yourself and your significant other. And why wouldn’t you want all the tools at your disposal to make the most of every opportunity for connection? Transformational Conversations take you beyond your words to create an even deeper sense of connection. You’ve one inspiration left untapped: the human voice. Conversation is a unique tool that can open up your creative process. When raising or mentoring a young person, knowing your own voice will help you guide them to reach their greatest potential and equip you with the tools to connect with them authentically. Start a conversation with anyone, anywhere, anytime - even on the tube, if you want! Replace self-defeating thoughts and beliefs with ones that empower you. Turn every spontaneous encounter into an opportunity to connect and learn. Generate ideas and ignite passions with greater ease. Have better conversations with greater depth, creativity and understanding. Have increased influence, warmth and charisma to positively impact dating, friends, business & networking. Discover like-minded people, friends and relationships, and experience community more easily. Make great first impressions and build rapport quickly. Become a better listener and experience greater openness with others. Every stranger becomes an opportunity for greater value in your life. Small talk disappears. Greater openness leads to awareness of opportunities that would have gone undiscovered. Which leads to serendipity, opportunities and always having something to say. A world of strangers becomes a world of potential friends. That's when you are speaking, hearing and together with others, being true. Yes, this is deep. We do deep. We don’t want to give you a plaster. Let’s delve into the real world of connection and the power of conversations. A three part journey split across seven weeks, designed to develop your skills from basic to advanced, expand and empower your mindset and beliefs, and help you practice everything to cement your learning. In part 1 you will join a community of fellow adventurers in conversation and begin developing your skillset. At the start of the programme we will work with you to identify and set your intentions, along with teach you how to gain accountability for your actions. Get to know your fellow adventurers and share your story and intentions so you can become accountable to each throughout the programme. Learn how to use opening statements, questions, handle different types of rejection, and set yourself an empowering, unbreakable personal law. Explore what it is to be playful and free to be yourself, whilst establishing deep connection. Learn how to spot traps of habitual conversation, instead steering it into exciting, unknown territory. 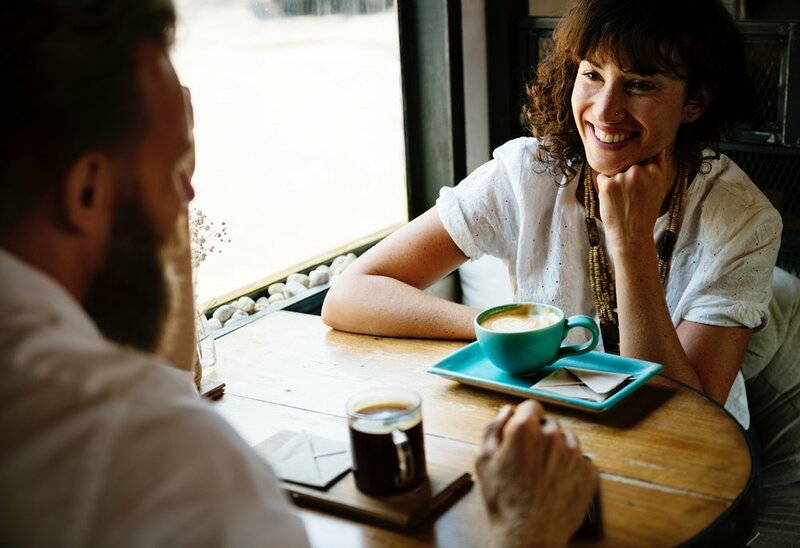 Learn simple tricks to establish connection and rapport quickly with anyone, and ultimately, make an unforgettable first impression. Push the boundaries that restrict your behaviour in society, then take your new skills outside! With the support of our team test out all you have learned on strangers. In part 2 you will come to understand your own mindset and beliefs, how they may be limiting you and how you can overcome them. By doing so you will learn how to become a better listener, with greater presence and have conversations without limits. Delve deep into what makes you behave the way you do and how you can free yourself from self-defeating habits and limitations. Receive 121 coaching from the team to identify and work through your barriers. Support is tailored to cement lasting change. Stealing techniques from both coaching and improvisation, learn how to engage with any topic through curiosity, so that you always have something to say and ways to connect in any situation. Cultivate a greater presence and learn how to develop the third level of listening so that you can delve into a deep conversation at will. Practice speaking your true thoughts and feelings to create a deeper sense of self and better connection with others. Learn a whole array of questioning techniques that ensure conversation is always flowing and expanding. Develop advanced tools so that a conversation with you becomes a profound, cathartic, impactful experience that others do not forget. Kick off part 3 with more 121 coaching that prepares you for becoming an expert conversationalist. Learn how to apply everything you have learned to network effortlessly and uncover hidden opportunities. Learn how to leave no stone unturned in order to reveal greater meaning and deeper truths. A meaningful conversation takes on many forms! Learn how we can connect by entirely indulging our surreal and mischievous sides. You’ve learned everything you need to know. Let’s see what happens now when we go rogue! The Founder of Trigger Conversations – Georgie has empowered 1200+ people to have over 3000 meaningful conversations at Trigger events. A TEDx speaker, Transformational Life Coach and Philosophy Specialist in Schools, she is addicted to conversations and determined to find the ultimate DMC (that’s Deep and Meaningful Conversation). Georgie is a lifelong learner. She has picked up degrees in Philosophy, Applied Psychology, Applied Linguistics and with a background in managing complex projects and events, she knows how to create and facilitate experiences that go beyond conventional norms. Her conversations superpowers include: Helping individuals to start conversations during in field conversations training. Getting into pretty deep and thought-provoking conversations with strangers, daily. Read about her stories on Facebook. Starting out shy, Joe worked a solitary job in Flood Defence. Recognising how his lack of social skills was holding him back he set out to transform himself by devoting his time to studying how we interact with each other. Quitting his job and moving to the City, he quickly made a name for himself working for the biggest social training companies in London including Your Charisma Coach, Hayley Quinn Dating Ltd and The Happy World Company. Joe will be leading: In field conversation training. Passionate about deep and meaningful impact, his clients have been an eclectic mix and have included students, CEOs, entrepreneurs (and more), from 12 to 56 years old, in 3 different languages, on topics from improving friendships to growing into a better leader to redefining identity in an existential crisis and much in between. Matteo will be leading: Mindset & Beliefs, Deep Listening & Presence, Networking & Engineering Serendipity, Transformational Life Coaching. Nerea Carryon is the founder of The Happy World Company and Smiles For The World. She is known for her huge and contagious positive energy and has dedicated her life to teaching people to eliminate their fears and self-imposed limitations. She is also an executive coach for these who are looking to improve their personality, self-esteem and happiness levels. International speaker, entrepreneur, model, comedian and YouTuber. A TEDx speaker, Millie is the founder of the Speaking Adventure and a coach. 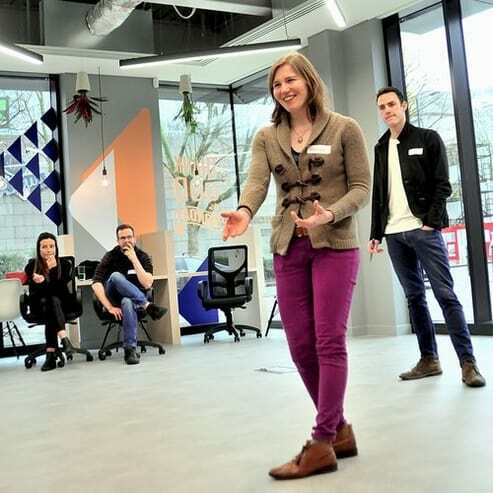 Over the past 18 years, Millie has worked with thousands of people from a range of backgrounds on topics like non-violent communication, writing, networking, public speaking and presentation skills. As a freelance trainer, she also works extensively abroad running workshops in communication skills for academics and scientists in cities including Berlin, Boston, Frankfurt, Hannover, Leipzig, Munich, Vienna, Zagreb, and Zürich. 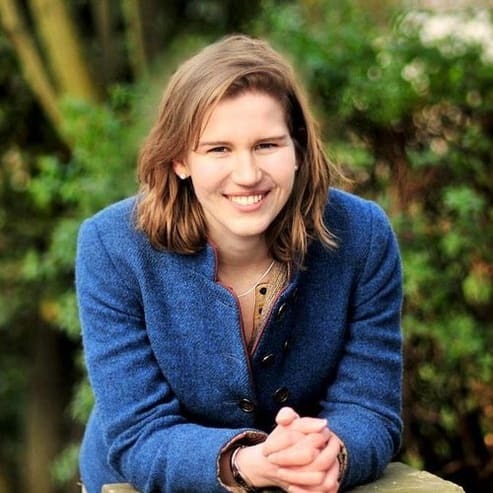 She studied teaching at university, and has continued professional development training in Neuro-Linguistic Programming, Non-Violent Communication, Focusing, counselling, psychotherapy and coaching. She is also a certified facilitator of Speaking Circles, and currently training in Hakomi, a mindfulness-based therapeutic approach. Millie continues to help in the belief that now more than ever the world needs effective, honest, and vulnerable communication about the things that matter. With 20 years’ experience in personal development, performing arts, group facilitation and coaching, leading transformative experiences is Natasha’s sweet-spot. To the outside world, she has dedicated most of her life to supporting people in achieving extraordinary things. Behind the scenes, she has also dedicated much of her life to seeking the kind of raw, magical, meaningful connection we crave. Natasha lived a nomadic existence for almost a decade, living and working across 28 countries; meeting amazing people. She believes that: Moments of connection – of unfiltered, non-judgemental revelation – are vital for human beings to thrive. Peter is an occupational therapist, personal trainer, writer and speaker. He is trained as a teacher in Mindfulness-based stress reduction (MBSR), Mindfulness-Based Cognitive Therapy (MBCT), Sleep Acceptance and Commitment Therapy, Stress Management, Personal Training, and Nutrition. He is also a Zentangle Certified Trainer (ZCT) and teaches Improvisation classes. Like many people Peter got to a point where the busyness and intensity of life was not sustainable and began to burn out. After a year of insomnia, he accepted things had to be done differently and made lifestyle changes, beginning a journey into mindfulness, understanding sleep and stress, through awareness and compassion. He now works practically with people around what they want to be able to do, breaking things down and exploring what's getting in the way, taking graded steps to change. 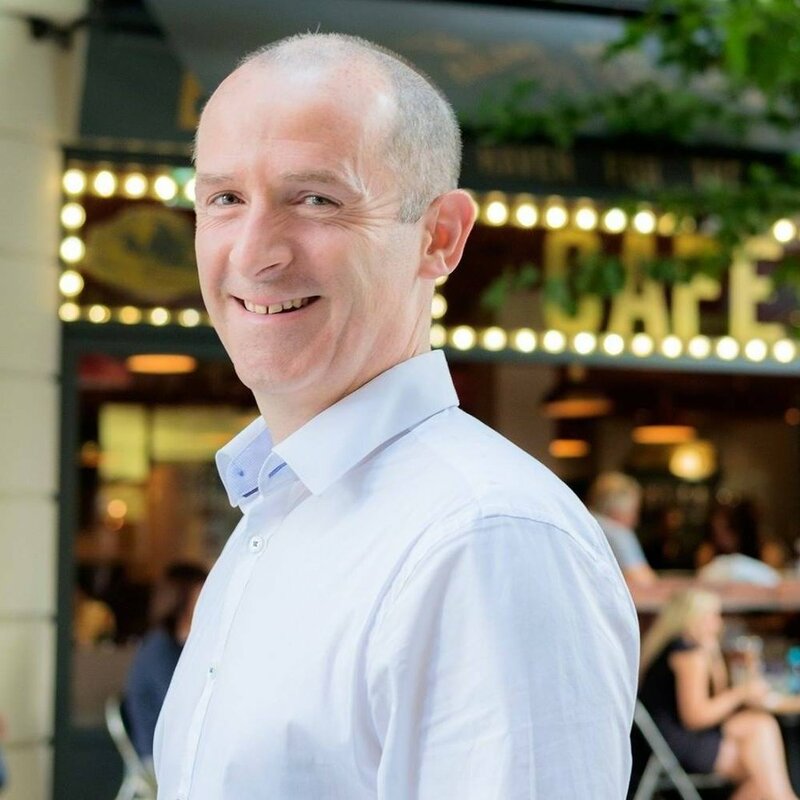 Peter writes as a contributor for the RTE Lifestyle show and has participated in radio interviews on Newstalk, Today FM and appeared on the TV show Operation Transformation. He also has a background as a personal trainer and views that balanced exercise is one of the best things you can do for your mental health. ‘Samuel Power’ is a beautiful expression of life, just like you. He has always had something of a leader within. A knowing that one of his gifts is to inspire others to empower and free themselves. He is an international speaker and coach, having worked with Platinum Mind University, Your Charisma Coach, The Happy World Company and Transcend The Mind. He has delivered coaching, seminars, workshops and retreats worldwide, lived and learned from Yogis in Sri Lanka, India and Nepal, and is a teacher of Yoga, Meditation, Mindfulness and Qi Gong, as well as a Master EFT Practitioner, Reiki Healer Vipassana practitioner, improvisation teacher and CAPD Presenter. He has gone deep into the understanding of what it means to be a human being, dedicated many years to find his truth. His strong desire for self-liberation has taken him to extremely dark states of being in order to truly rise up like the phoenix and lead with experience and conviction. He knows the game of suffering, depression and fear very well and has learnt in great depth how to bring others out of these states, ultimately back into ‘light’. Our next programme runs from March 11th to April 1st 2019 across 1 weekend, 1 evening and 5 calls. We know the formula for great conversations. 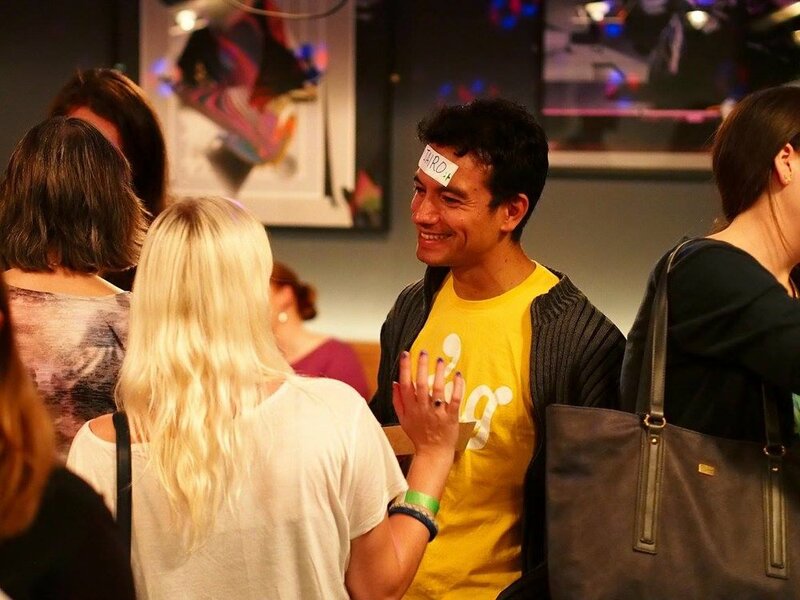 We’ve run over 70 events, brought together 1200 people for over 3000 meaningful conversations and have 70+ 5* reviews to show for it on Facebook (check them out!). But in case you’re not sure about investing in us then you’ll be delighted to hear that we’re offering a 100% money back guarantee if you don’t feel your conversation abilities have been transformed. So there is nothing for you to lose! Weekly calls involve tasks and check-ins with your Course Leaders to ensure you stay committed to developing and growing your abilities - let’s keep the momentum going! 2 Transformational Life Coaching sessions for an hour each with an accredited coach. Access to an exclusive Transformational Conversations Programme Facebook Group to keep you connected to community. Great for support and accountability! Complimentary tickets to our flagship classic Trigger Conversations evenings throughout the programme so that you can put your skills straight to use. A Trigger branded workbook - to record your key learnings, ideas and reflections. And it’s a beautiful way to capture your journey too. I can’t attend an Appetiser event but I’m interested in attending the programme. Great! Email us at hello@triggerconversations.co.uk, or click here to complete an online form, and one of the team will call you to see if the programme is the right fit for you. How many people will be on the programme? As this is the first Trigger programme , we’ve decided to limit it to 20 places so you’ll receive lots of individual attention, feedback and support. Do I need to attend every workshop? In short, we recommend you attend every module. Because it is in three parts, each part will build on the next. This is an immersive programme - spread out over three months with both offline and online components and weekly homework - to ensure you actually use the skills and tools you’ll learn in every part of your life. There is no magic pill to transforming your conversations. You are the pill - you have to commit to taking action. And we can help keep you accountable so that you can achieve this. We’re looking for people who are committed to making a lasting change in how they have conversations, in every part of their life. It sounds like a cliche but the more you put in, the more you’ll get out! If you have attended 80% of the course, completed 80% of the homework assignments and still feel that you have not developed your conversational abilities then we’ll be happy to offer you back your full course fee. I can’t attend the pilot programme dates, when can I sign up for the next programme? If you’re available for an Appetiser evening in August and September then come along to gain some nuggets of insight. We would also love to arrange a call with you to ensure the course meets your needs. You can pay a deposit to secure you place on the full Transformational Conversations programme (starting Feb 2019) from Sept 2018. What’s the age range for the programme? At Trigger events and workshops, we’ve had people of all ages walk through the door - we don’t discriminate. We’re happy to have you whatever age you are (18+) as long as you’re suitable for it (see ‘Who is this programme suitable for?’ below). At Trigger we invite you to leave your labels at the door, so we don’t care what your background or job is, or if you live in North or South London! Each person will come for their own reasons. But you shouldn’t come unless you’re committed to make to making a change in your life. This isn’t just a workshop to give you tools that never put into practice. This is a immersive programme to help you have better conversations in every aspect of your life. By applying the tools - taking small actions - in your life you’ll discover a whole world of new opportunities that never existed before. And that is unbelievably exciting. It might not easy - it might be challenging and scary - but, if you’re committed then we will do whatever we can to help you achieve your goals. People who want to get to know themselves well - their paradigms, their limiting beliefs and behaviour patterns and are willing to tackle them head on. Doers. Reading the books, listening to inspiring speakers and thinking about your future potential won’t get you there. You have to take action, even if it feel scary. People who want to find the edge of their comfort zone, and step over it. People who are passionate about people. After all, conversation is about connecting with others. People who recognise the value of conversations - that is drives all our relationships which unlock a whole host of hidden opportunities. Humans. Seriously. We don’t want to see a facade. We want the quirks, the crazy side and you, just as you are. We want you to just be real. People who are committed to attending the whole programme, completing the homework and putting everything you learn into action in your all aspect of your life. People who see learning and growth as an adventure and journey. Enjoyable, surprising and sometimes full of both up and down moments. People who are taking responsibility for their lives. What happens to you may not be your fault, but it is your responsibility to do something about it. People who are patient and are committed to taking small continuous steps. This is absolutely fine as long as you are able to be in London for all (or almost all) of the sessions. We know participants are travelling from Bristol for the course, for instance. In order to get the most out of the programme you will need to be in the room.